Why are information management systems moving to the cloud and SaaS? The SaaS model also offers more flexibility from a licensing point of view. You pay subscription fees for the services you need, and then you’re ready to put the software to use with minimal ramp-up time. There’s a fundamental change going on in the information management market. This industry, formerly known as enterprise content management (ECM), has transitioned to the cloud much slower than, for example, customer relationship management (CRM) suites. Only a few years ago in fact, the leading industry analysts estimated less than 20 per cent of the new implementations in our industry were deployed to the cloud. There are many reasons for ECM’s slow adoption of cloud – from customers’ data privacy concerns to performance and cost. However, times are changing. According to the recent The State of Intelligent Information Management study by AIIM, more than 80 per cent of information management professionals plan to move toward solutions that are at least partly cloud-based. The information management industry’s change in attitude toward the cloud during the last three years has been remarkable. Customers are beginning to trust cloud providers more than ever before, and vendors have begun launching offerings that can leverage both cloud and on-premise infrastructures. Vendors’ mind sets are now more likely to be “cloud-first” than “cloud-only,” and hybrid cloud seems to be the long-term way forward for data officers, rather than an interim, on-premise-only solution that serves as a temporary stopgap before transferring all data to the cloud. According to the AIIM study, 81 per cent of organisations believe that digital transformation is important to their organisation. In fact, the AIIM study also finds that for 70 per cent of organisations, the monolithic model characteristic of the ECM era has been replaced by a desire to consume content capabilities as needed – i.e., content services. A content services framework introduces the architecture for modern, intelligent information management. Content comes in numerous different forms and is stored and utilised in different systems and repositories. Additionally, the vast majority of an organisation’s information typically resides outside its content management system. 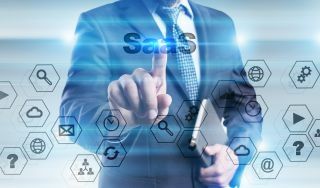 Intelligent information management no longer depends on a single, monolithic ECM solution; rather, it’s built upon several services that are integrated through APIs. All these layers are unified, giving access to content regardless of the system or repository where that content resides. The unified content layer allows users to interact with content through metadata, which gives context and value to information. This improves the usability of data and allows users to separate business-critical data from the mass of dark data. Cloud technologies have their clear benefits, but cloud might not be the obvious choice when looking for control and compliance. Control and compliance are often priorities to organisations, especially with the increasing amount of legislation and compliance requirements today. Despite this focus, employees want ease of use, an intuitive user experience and flexibility to work outside of office hours or company premises. If an organisation does not provide suitable tools to meet employee demands, employees will invent their own ways of working. The key to better user adoption is to provide engaging solutions that are easy to use, automatically up to date, easy to integrate and mobile friendly. Hybrid solutions offer the best of both worlds. Hybrid solutions can offer control, compliance and management of established records on-premise, as well as the flexible user experience employees are looking for in their everyday work through cloud-based applications. A hybrid infrastructure also eliminates the need for data migration, allowing organisations to keep legacy content where it is. There are several upsides to cloud services. For example, cloud services offer an unbeatable opportunity for mobile work. Cloud services enable companies to provide their employees with more flexible ways of working, with no negative effect on productivity. Collaboration through shared services further improves productivity as well, as teams are better able to interact and collaborate on a project, sharing the same tools and documents. The cloud also offers more elasticity than traditional virtualised server environments for compute-intensive workloads. For example, some artificial intelligence services, such as computer vision APIs, require a level of capacity that is just too expensive to maintain on-premises. With multi-tenant cloud services, cloud providers are able to supply hyper-scale computing on-demand and at a reasonable price. The SaaS model also offers more flexibility from a licensing point of view. You pay subscription fees for the services you need, and then you’re ready to put the software to use with minimal ramp-up time. Furthermore, IT personnel will need less time for server and/or software updates, as many cloud solutions offer automatic updates. Although some vendors might shy away from cloud solutions because of privacy and data security risks, it is worth noting that the biggest cloud providers can provide enterprise-grade (or better) security for smaller departmental solutions. Data centres are often very redundant and connected to multiple power grids, and data storage is geo-replicated and well encrypted. For most businesses, it is impossible to acquire the same level of redundancy in their local data centres or server rooms. Most cloud providers also offer flexibility in selecting the physical location for data storage. With the development of new technologies and new types of offerings addressing the smaller customers, ECM solutions are making their way to SMBs and mid-tier companies. The typical drivers – cost reduction, speed to adoption and business process transformation – boost the expansion of information management solutions to smaller companies. Meanwhile, the same typical concerns – loss of control, data security and the integration of cloud with the existing architecture – might slow down the transition to cloud services. However, smaller companies typically have less existing architecture to worry about, fewer internal resources to track and maintain, and can quickly build expertise on data security. This makes the decision to move over to cloud and hybrid solutions a relatively easy one to make. Hybrid solutions help smaller businesses overcome most of these issues, offering more control where it is needed while improving collaboration and ease of access to content that needs to be reviewed for security purposes.